So a couple of weeks ago I managed to get my homelab backups running with Altaro. 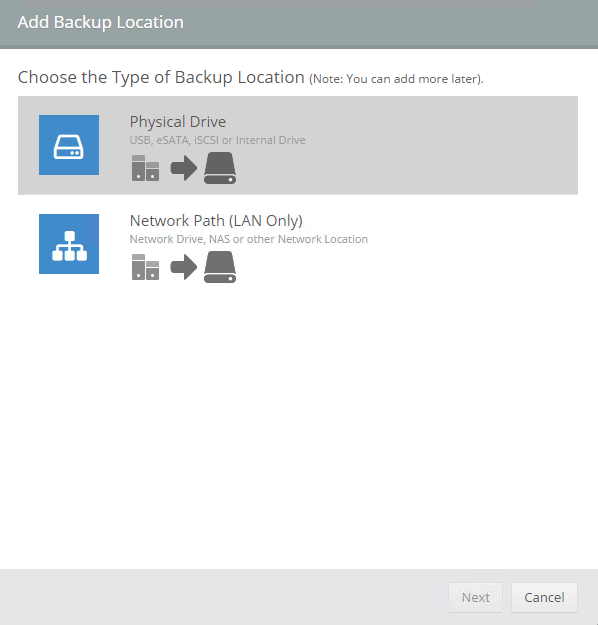 Backups off course are nice but are worthless if you can’t recover them. This is why this 2nd and last part of mini serie is about restoring the backups. 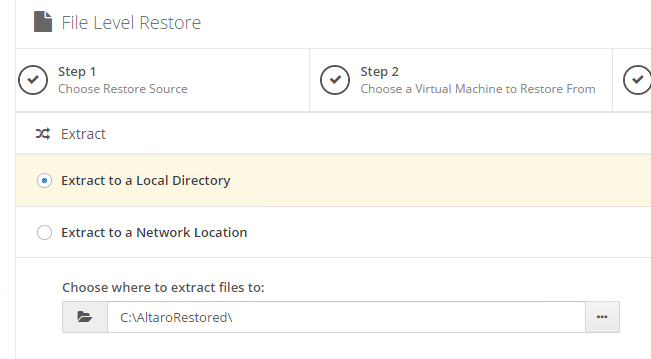 Altaro has several options available: Restore clone, to a different host, File level restore and Exchange Item level restore plus the option to do a sandbox restore or simulation for testing those backups. Not that much, disk E is in use for the domain controller, file server, pfsense and server 2012 template while disk F is in use for the vCenter server, Platform Service controller and windows 7 template. A very small growth rate but then I haven’t done a while lot with the homelab in this time. But the compression and dedupe are nice while the cpu doesn’t even spike that much each day. Ok, enough text about disk usage, let’s actually restore something! 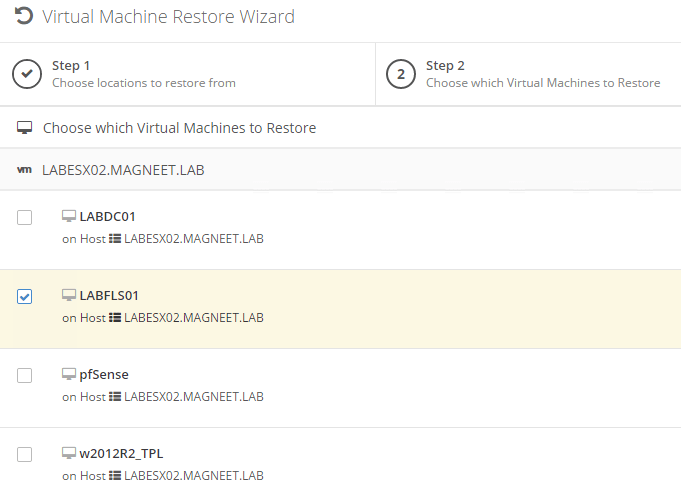 First up is VM restore. 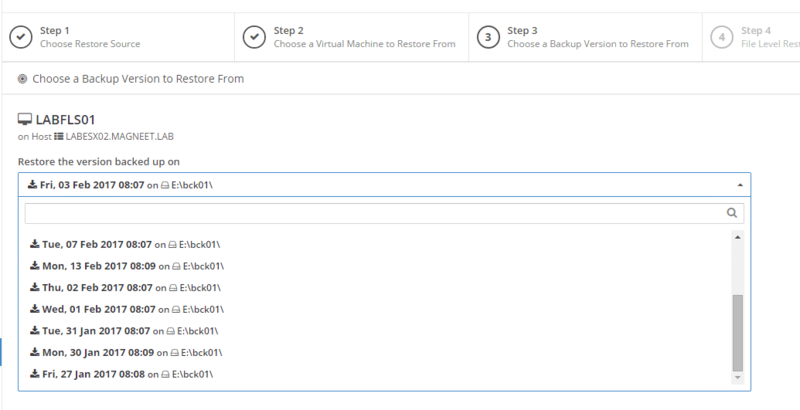 To start select the datastore where the VM is saved. I would have preferred to select the VM first because at this point I don’t care where it is saved I want it back asap. And yes I can select all datastores but that shouldn’t be needed. 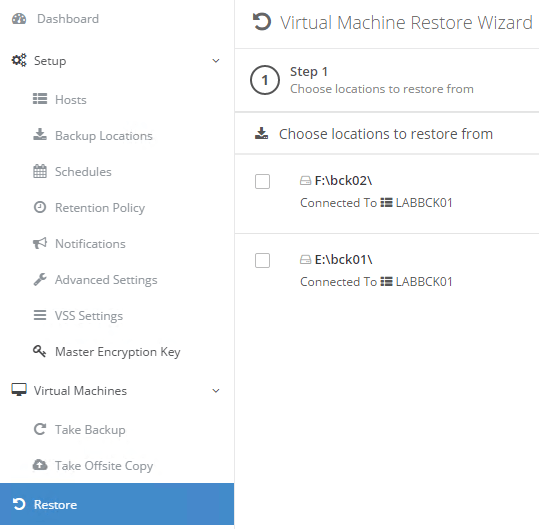 Here I can select the point in time to restore from, the name of the restored VM (why does the default name contain clone while it’s a restore? 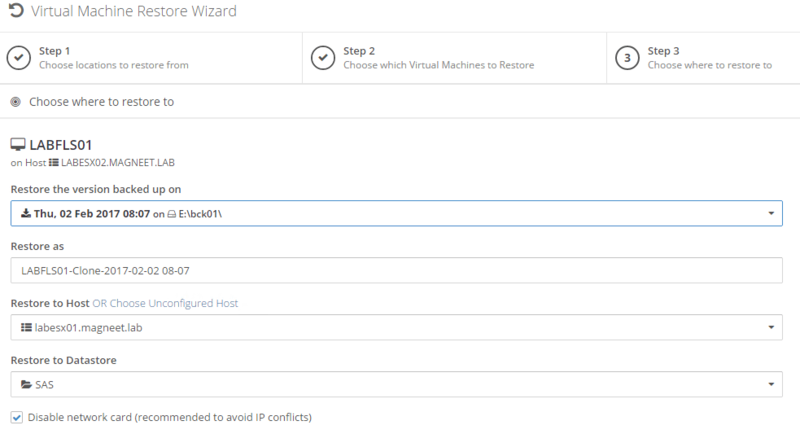 ), where to restore to and to disabled the NIC or not. File level restore isn’t that different from a VM level restore. 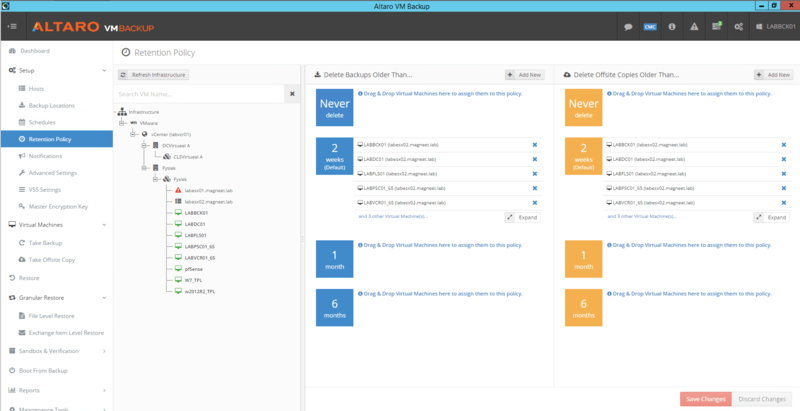 I won’t bore you with the screenshots but first select the datastore and vm to restore from. Then select the point in time you want to get something back from. I don’t really get the order in which this is presented either. 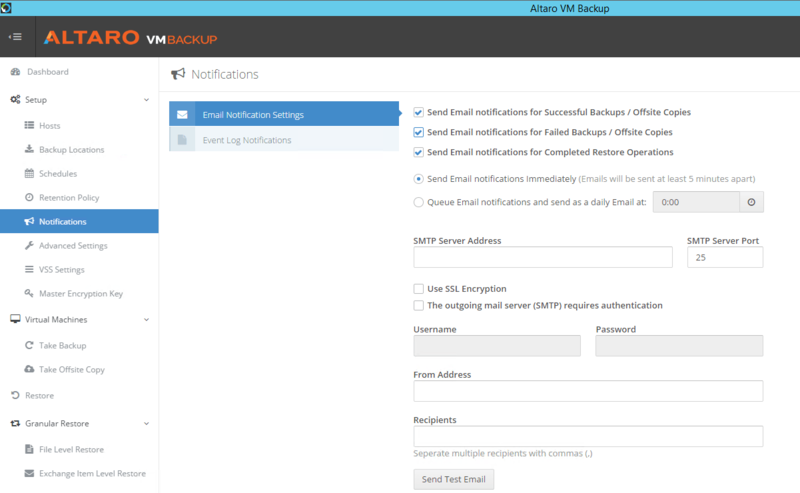 Sandbox testing the VM’s is rather easy as well. First choose what you actually want to test. At first I’ll try the option to verify folders. For some steps I will only show the image because I am afraid that you’ve already fallen asleep by now. 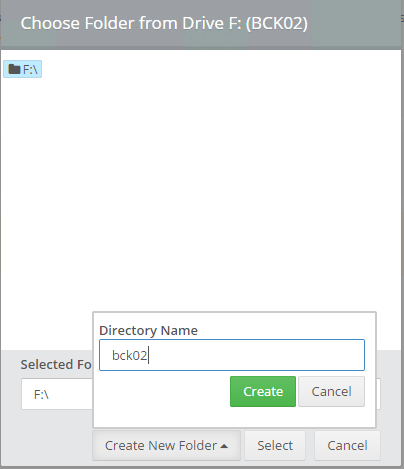 Very weird but I can’t select any folders to test? My guess is that all folders will be tested, why do you name it verify folders then? The full Test Restore is exactly the same but it mounts the VM so you can see it booting. To me this sounds exactly like restoring a VM with its NIC disabled. There seems to be no notification of a successful test and I needed to go to the dashboard to see if it succeeded. And there only the result is visible and no logs or anything. 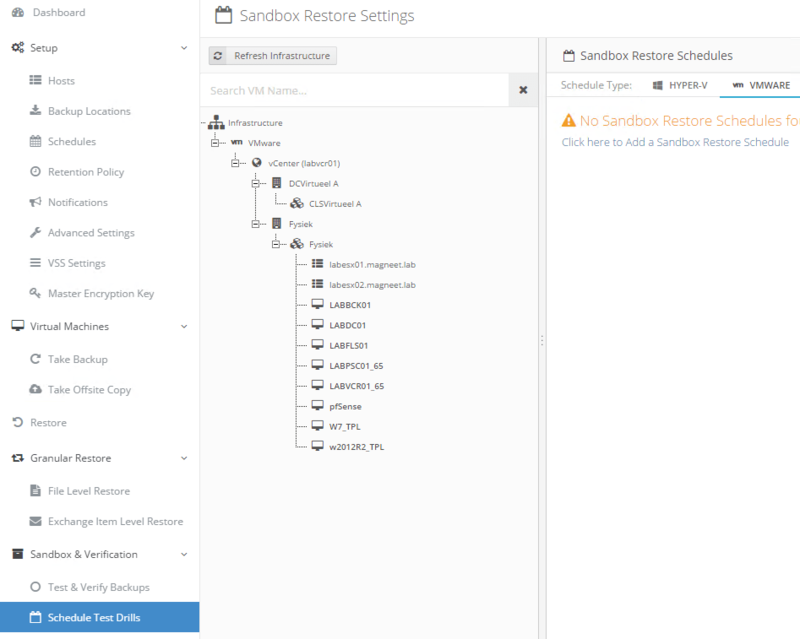 Also the option to remove the sandbox VM is missing. 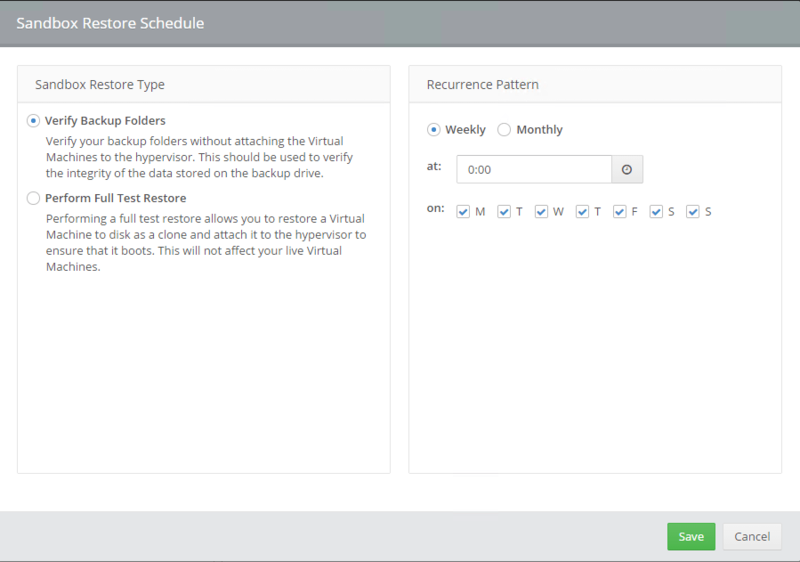 So for the full test restore you can select after how much time the VM will be deleted. Besides the schedule not a whole lot of options. After the schedule has been created you need to drag a VM to the schedule. 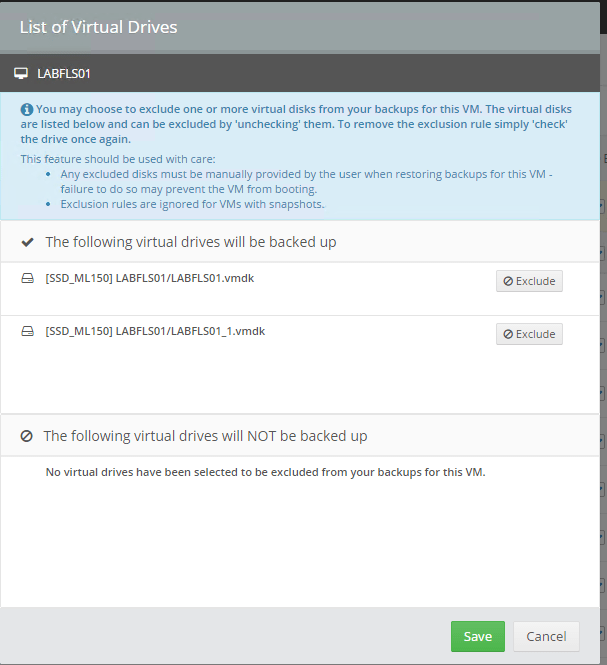 I guess this will test the last version of the VM backup but for me it would be nice to also test two versions earlier or something. The storage I use won’t be able to handle this properly but Altaro also has the option to boot a VM directly from the storage it is saved on. First select if you want to do a verification or recovery mode boot. To show the screens I will take the first option. It has the same screens to select storage,VM and date so I won’t bother you again with those. 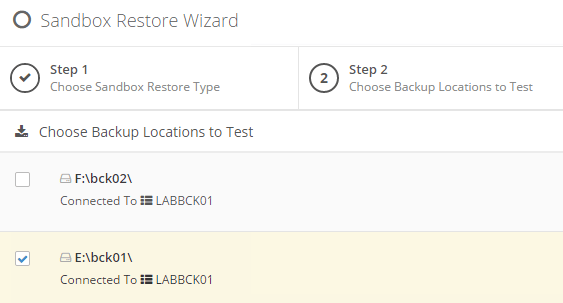 At the version tab you can again select the host, datastore to restore to and if you want to have the NIC’s disabled or not. The reporting doesn’t really contain a whole lot except a list of succeeded or failed tasks. The detail button doesn’t add a whole lot of information either. The error history shows a bit more information but still not a lot. Altaro is a reasonable well done product that lack’s a bit in options for the professional in me. Getting it running is easy and for smaller environments (up to 50 VM’s) where there is no dedicated admin it should get the job done. If they make the move to a Linux based appliance that might be better because for these smaller environments every penny and thus license counts. 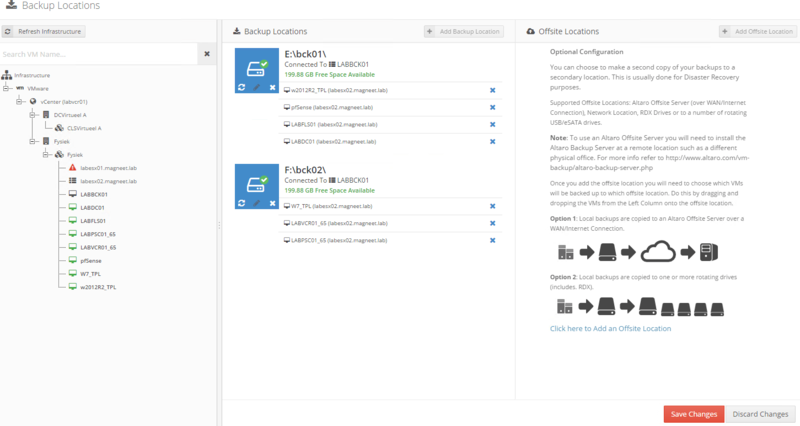 What I do like are the build in options to actually test the backups. 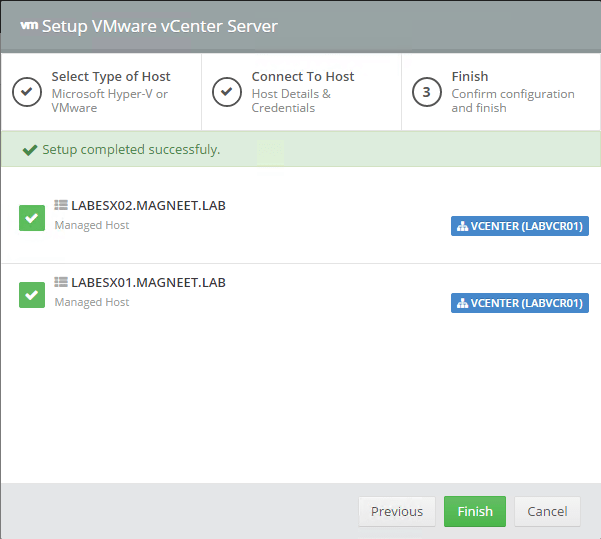 One of the perks of being a VMware vExpert is that you now and then get licenses for and a chance to play with new software. Since I needed a backup solution for my lab I remembered a couple of Backup software builders int he list of companies that support the community. 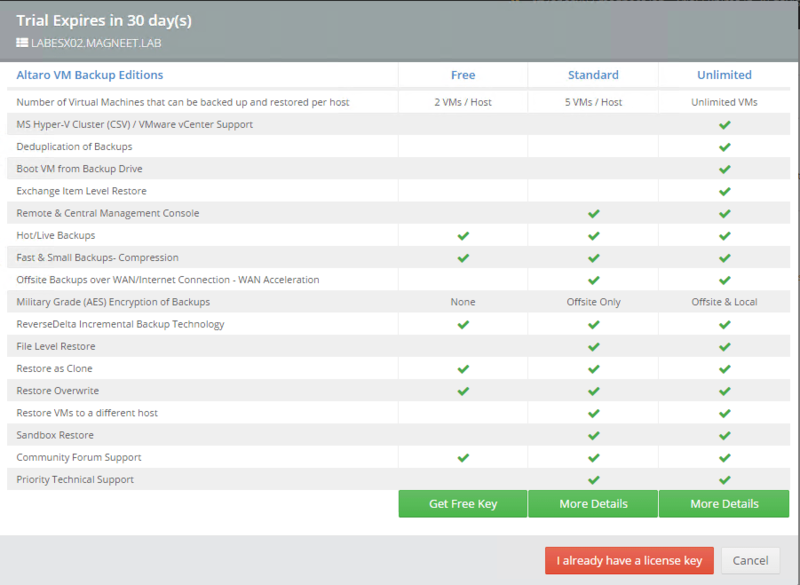 From this list I decided to give Altaro a go and requested the vExpert NFR License. Within a day I received the license and it turned out they just released a brand new version of their software: Version 7! You can go to Altaro’s website to see what’s new in this version. The mail contained a download link to the software and after a while I had a new (backup) vm rolled out (someone who wants to sponsor a NUC with 32GB RAM for me? ML150G6’s are slooooooow). Installing the software is next next finish so I won’t bore with that. One thing I noticed is no requirement for a database server. Let’s hope my disks are fast enough for what Altaro does. This post is in no means a deep dive in what Altaro can give you. It’s a step by step guide to set it up and get started with the product. Also I show some features that are present in the console. Except for the NFR license Altaro has had no influence on this post itself. 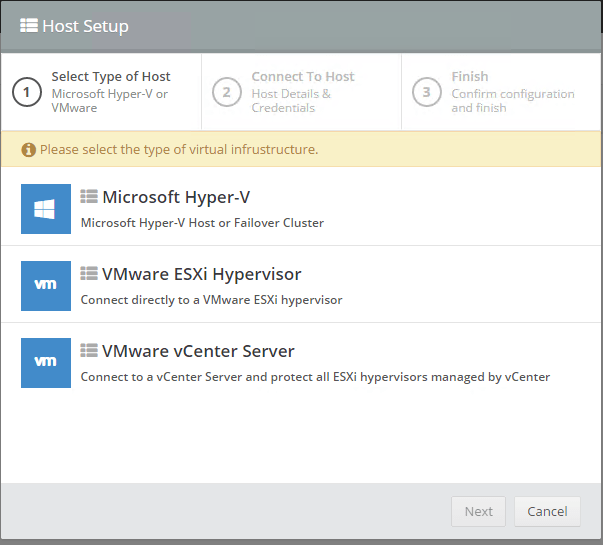 So here you can select between loose ESXi hosts and vCenter, I selected vCenter. 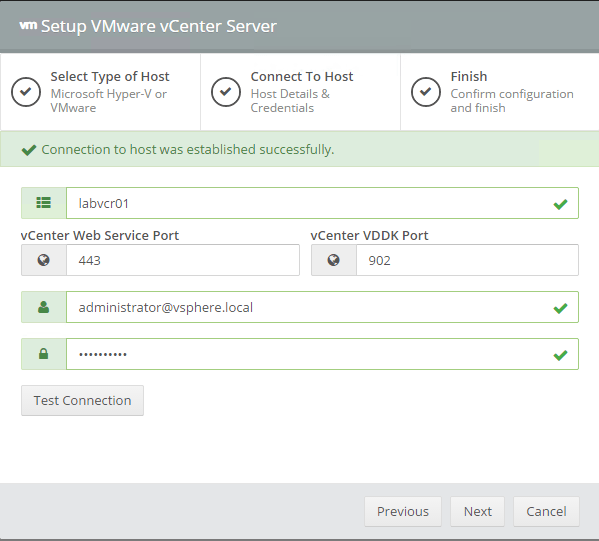 Enter the vCenter’s dns name/ip address and proper credentials (yes I am lazy in my lab) and next (it wil test the connection itself anyway. Under port settings you can set alternate ports if required. 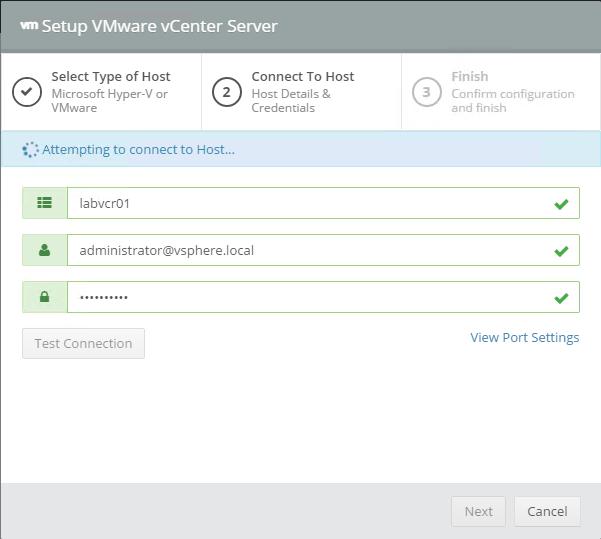 Altaro will now recognize and add the ESXi hosts that are added to the vCenter server. It had no problems with my LABESX01 that is powered down. Hit finish to end this. You are taken to the hosts screen where they show running on a trial license. You can hit the 30 days remaining to add licenses, the licensing options will be shown. The license can be added with the appropriate button. 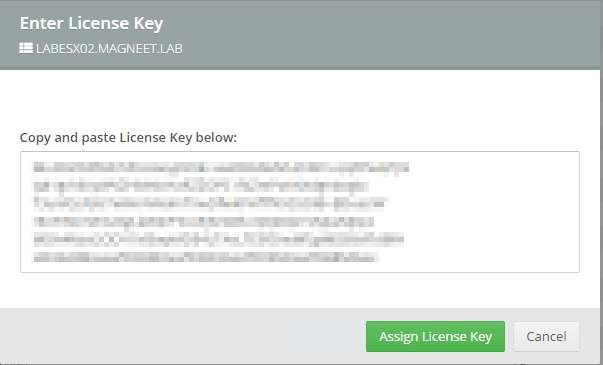 Enter the license key and select assign license. You need to repeat this for all hosts! After this I went back to the quick setup screen to add storage. Altaro has several options to write to but I added a couple of cmdk’s to the backup server that run on local slow as **** sata drives on this server. 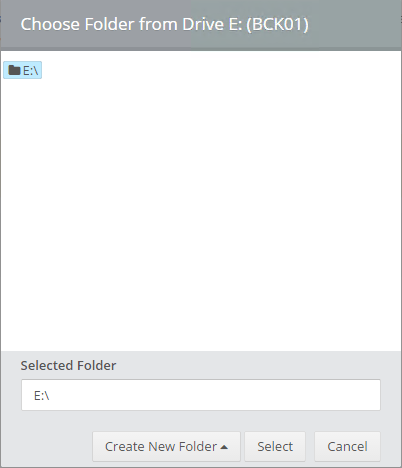 Select the disk (yes these screenshots are mixed up), create a new folder if you want and choose select . 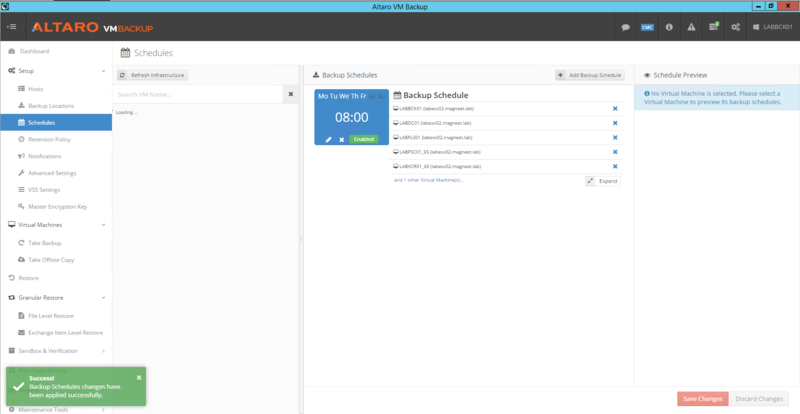 When the storage is added you can link vm’s to the storage by drag & drop. back to the quick setup i went and choose to create the first backup. 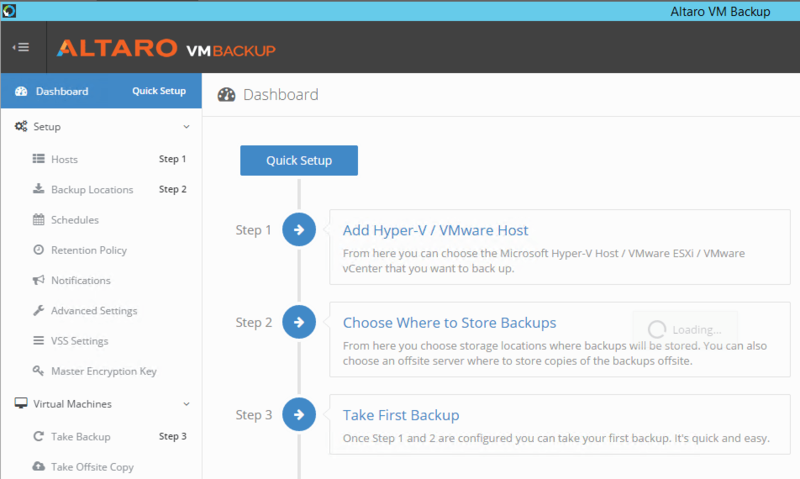 this will take you to the take backup screen, select the vm to backup and hit take backup. 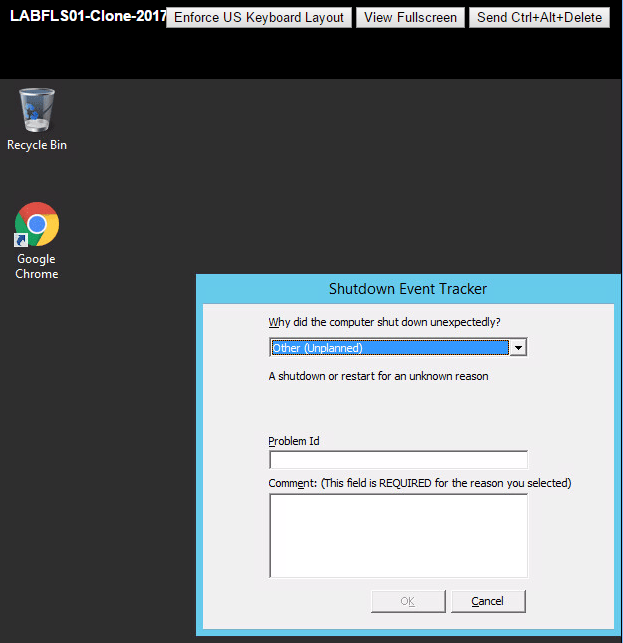 Select the time and days you want to run the backup at. When the schedule is created drag and drop the vm’s to the schedule to link them. Don’t forget to save these settings at the bottom. 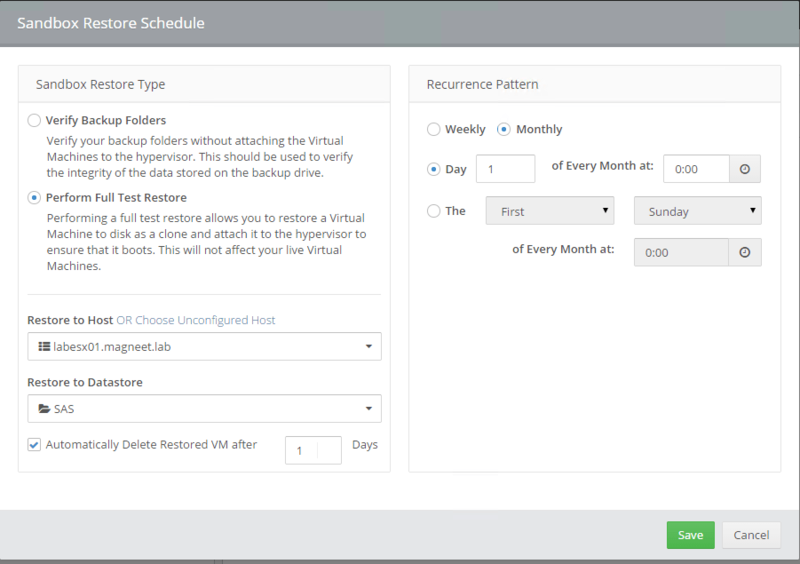 Setting retentions is fairly easy, by default vm’s are linked to the 2 week retention policy. If you remove them by clicking the X they wil get moved to the Never delete policy! Please be aware that after adding a retention time I wasn’t able to remove it so this might get cluttered easily. Fairly basic stuff in here, you can get notified by email or events int he event log. Not that extremely advanced but under advanced settings you can select deduplication, encryption, iso’s to be backupped and if Change Block tracking needs to be used. The last option is exclude drives where you actually select the vmdk to exclude so make sure what vmdk is what drive or mapping. 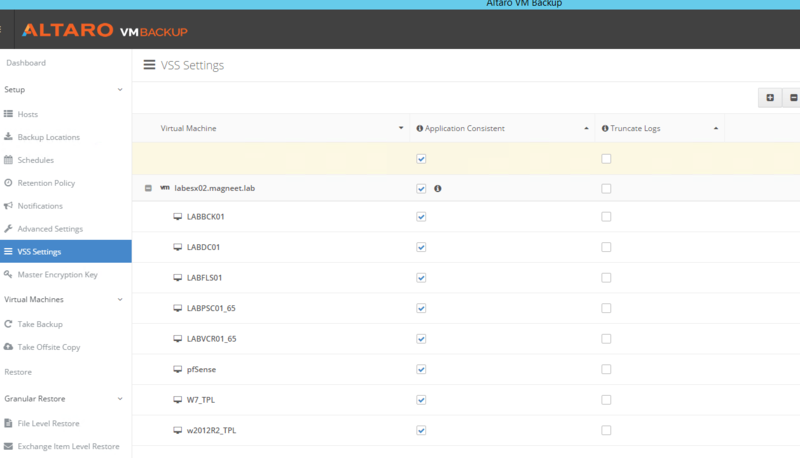 Under VSS Settings you have the option to select application consistent backups and to truncate logs. .The name says enough about what this does. 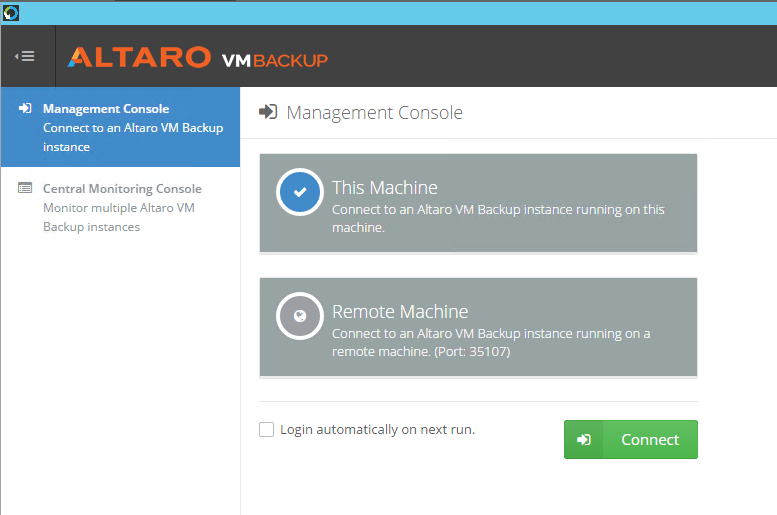 In this part one we got started using Altaro Vm Backup 7 and viewed some of the options In the management console. In the next part we’re going to see if we can actually restore files, maybe start a vm from backup and see what the sandboxing does. VMworld 2016 US Part 4 – the last one! So right now it’s thursday evening and here I am in my hotel room too damn tired to even go outside. VMworld is a wrap and wow it was awesome. Yesterday I had 2 more sessions. First a quick vExpert session at the Docker booth where we got a nice vExpert embroided hat.Then it was time to get the vExpert Raspberry Pi 3 at the Datrium booth. Men they had big issues on getting them in but succeeded at last so thank you very much for that! I ended with a Rubrik session with Chris Wahl that was pretty good. In the evening it was time for the biggest party of them all at the Las Vegas Motor Speedway. To be honest I think the sound of the bands sucked and the music of the dj’s wasn’t good either but I had an awesome time playing all the games, talking to people ad even made a lap in 1 of the 50! Rental cars that wil probably be going back to budget with hardly any tires left. So today was the last day and I did only 1 session and that was about troubleshooting Horizon and killed the time by doing some labs and hanging at the vBrownbag area where I learned a lot by listening to the sessions. This space just seemed to be vExpert HQ the whole week. All in all I think this was the best way ever to experience your first VMworld. I really want to thank all vExperts for welcoming me in the community because I don’t think I would have had such an awesome experience without you guys! Wow it’s wednesday already, time flies at VMworld! Yesterday again was an awesome day, first the 2nd keynote and after I had to head out to the Luxor for the Inner Circle fireside chat. The Inner Circle is a group of about a 1000 people that is engaged by the VMware Customer Advocacy program. We have our own forum, weekly polls on the site and surveys by mail. Our feedback gets handled by VMware on a high level and personally I really have the idea that they listen to us. The fireside chat they had an idea of how to do it but it ended as an organized free for all where VMware received honest, harsh but really good feedback. In short they got slaughtered on several topics. They did not expect this so it was good to see that they seemed to handle it pretty wel. Later in the day I went to stop by at their boot hand asked them to get more vExperts involved because I think we are exactly the kind of people that can give this feedback. Because of the Inner Circle session running way over time and me getting hungry pretty bad I missed the uem 9 sessions so I hope that one is recorded. My final session of the day was the vSphere 6.x Host Resource Deep Dive by my fellow Dutchies Frank Denneman and Niels Hagoort. This session was soo deep the entire Mount Everest might fit into it. Really good stuf and very useful. After the sessions it was partytime! First a quick beer and a snack at the Inner Circle reception and after I hopped on the bus to The Mob Museum for my first vExpert party. First we had our mugshots taken. We got a print but also digitally by mail so please check mine on Twitter. We had great fun over there and had Pat Gelsinger over doing a Q&A for over an hour! Best quote? Hyper-V is free as a puppy! Today I had a hard time waking up, not getting out of bed but during my first session at 8 am I was not paying enough attention at all. But still it was a good session on how to architect a HA resilient scalable mobility & desktop environment. After that I had a session about troubleshooting avSphere 6 environment by a couple of GSS guys and picked up a lot of good stuff! Òk so in part 1 I stopped after the Partner General Session. After lunch I wanted to do some labs but the queue was really awfull so I decided to attend a group discussion about vCloud air or mobile management in general. I got some good info on the view about this from the us people while I managed to spice it up now and then with things we dutchies like or don’t like. Monday was the first real day of VMworld. During the keynote VMware cloud foundation was announced but I don’t think I will use this multi cloud management platform in the near future. After this it was time to prepare for my vBrownbag session. I was really nervous and went over my stuf way to fast so I was done in 6 minutes or something. If you want you can find it here. The afternoon I had 2 awesome sessions: enforcing a vSphere cluster design with powercli by Duncan Epping and Chris Wahl and after that a ask the experts session about VDI wich where both just awesome. 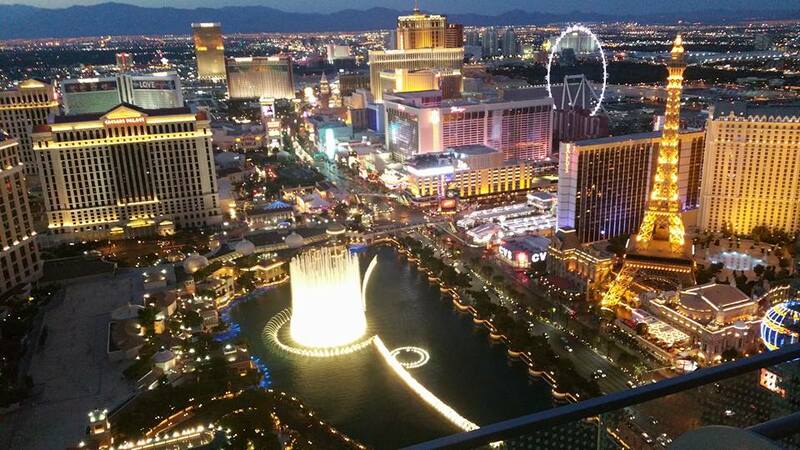 I finished the day at the CXI Party on the 59th floor of the cosmopolitan with a great view. RIght now I am setting in the Partner Exchange lounge and since I have some time at hand it might be time for a short message from the US. Since this is my first VMworld, first time in the USA I have to admin I am really in awe of everything over here. Everything is just soo big. Now about VMworld itself, yesterday I was in a vRealize Automation bootcamp for the whole day and really liked it. It seems to be very complicated but after you create the blueprints everything will be easy (Really?) I do see the advantages that are to be gained so it was nice. In the end we went over all exam questions as a group before most of us did the exams. I managed to pass the first but with the 2nd one I really started to get tired so I’ll gues I need to do that again. We do have 99 times to try it so it’ll be good. Now to the sunday morning. I had 2 deepdive sessions. One about EUC & NSX and the other one about app volumes. Both where not as deep as I expected but a lot of knowledge was gained in those 2 hours. After that we had the Partner General session were wounded warrior Pat Gelsinger had a nice chat with Michael Dell and we had some information on stuff that is coming in the near future. 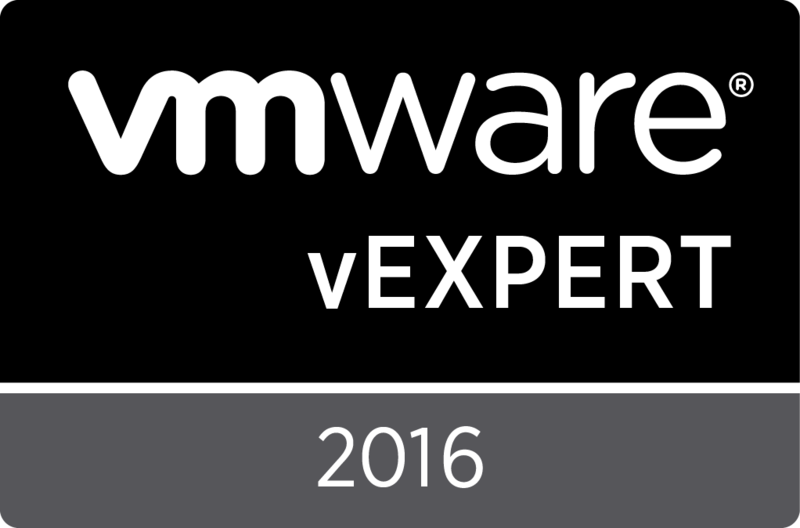 Last friday I received word that I was added as vExpert in the 2nd batch of 2016. After several people nudged me to apply for this I went ahead but never expected to be chosen. vExpert is no technical title but more of an award for people who have done things for the VMware community like speaking at Vmug’s (which I did but failed at), blogging, tweeting en being an advocate for it with your employer or customers. I never did the things I did last year for this goal but it’s an awesome acknowledgement. I hope to be able to keep contributing to this awesome community and will do so as long as I have content. The first thing will be speaking at the vBrownbag sessions at VMworld US 2016!